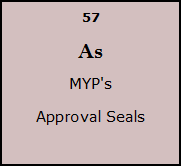 MYP Approval Seals is a certification that MYP awards to companies that is up to a certain standards in fields like Environment Conservation, CSR and Employee Welfare, we will increase the list of certifications as we go on. This certification seal will be awarded after a careful scrutiny and assessment of your company in that particular field. MYP will award certification seals only to companies which respect the criterias that will define in our MYP Certification Seal Policy, which you will be able to consult online. MYP officers will make visits to the premises to ensure that the Certification that we have awarded is fair and deserved. We will not want to entach our credibility by awarding Certifications to businesses who are undeserving. At MYP we will use our vast experience to accredit businesses seals for outstanding performance in their fields on the national level. In the long run we expect to deliver the seals at an annual ceremony.